Warm-up for 01.07.10 DO NOT COPY, JUST DO! **1. Using the dictionaries at your table, please define the words arbitration and mediate for warm-up. 2. After. 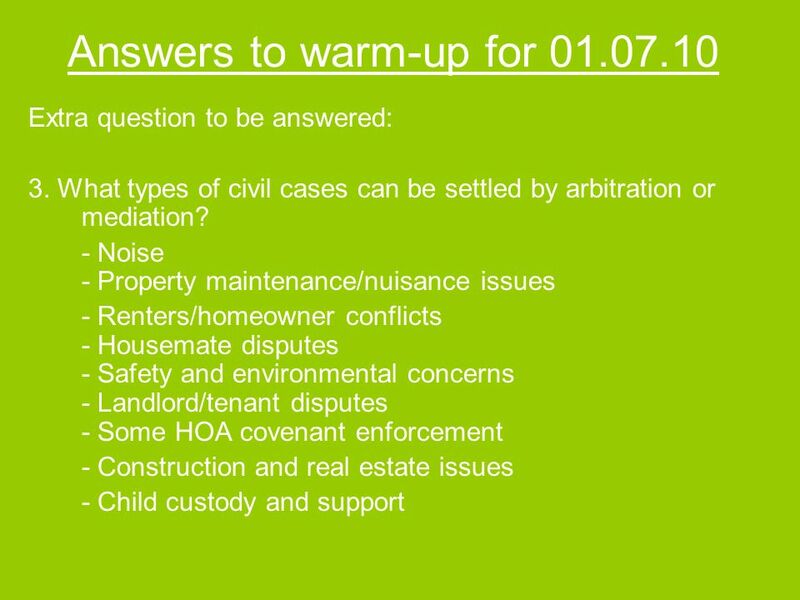 2 Answers to warm-up for 01.07.10 1.Arbitration – the process of referring the issues to an impartial person or group for judgment or settlement Mediate – to settle differences by working with all sides to help them come to an agreement HOW ARE THEY DIFFERENT? 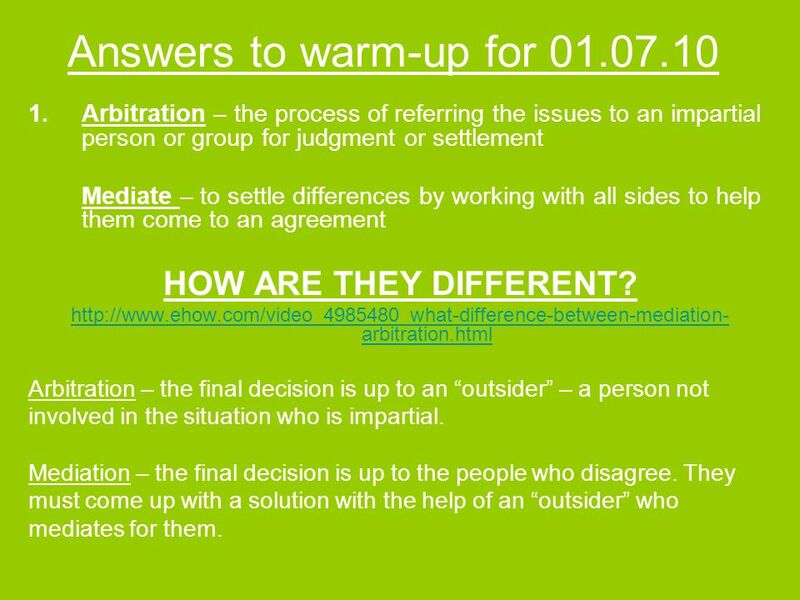 http://www.ehow.com/video_4985480_what-difference-between-mediation- arbitration.html Arbitration – the final decision is up to an outsider – a person not involved in the situation who is impartial. Mediation – the final decision is up to the people who disagree. They must come up with a solution with the help of an outsider who mediates for them. 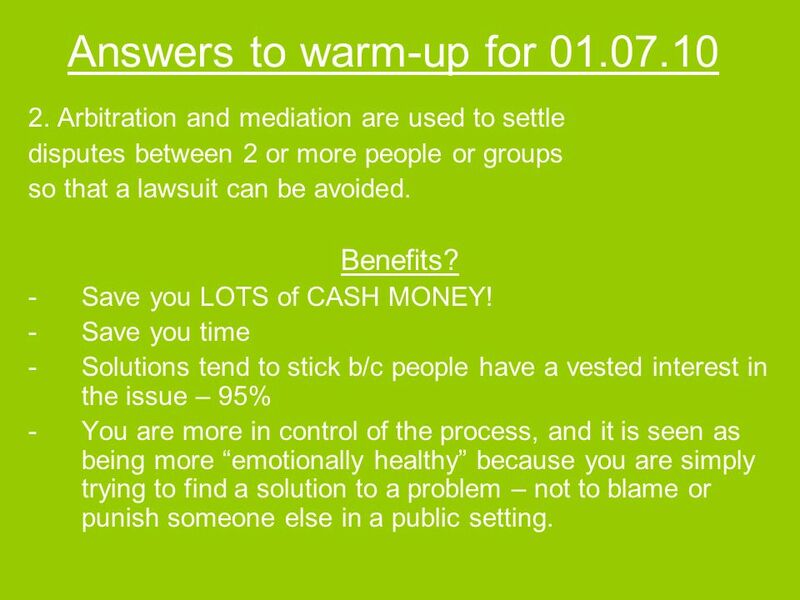 3 Answers to warm-up for 01.07.10 2. Arbitration and mediation are used to settle disputes between 2 or more people or groups so that a lawsuit can be avoided. Benefits? -Save you LOTS of CASH MONEY! -Save you time -Solutions tend to stick b/c people have a vested interest in the issue – 95% -You are more in control of the process, and it is seen as being more emotionally healthy because you are simply trying to find a solution to a problem – not to blame or punish someone else in a public setting. 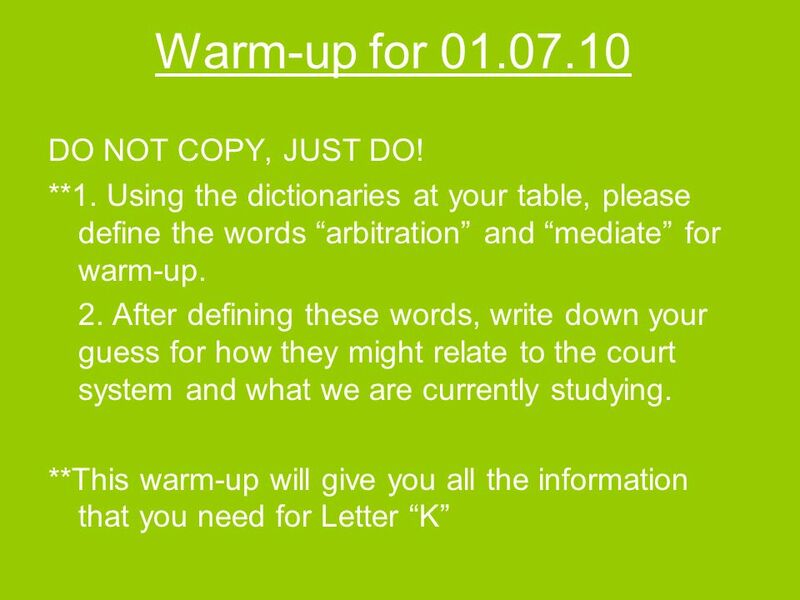 Download ppt "Warm-up for 01.07.10 DO NOT COPY, JUST DO! **1. Using the dictionaries at your table, please define the words arbitration and mediate for warm-up. 2. After." Q. ________ refers to the ways in which you send and receive messages. The Short Sale Process An Option To Avoiding Foreclosure 1. 5 Reasons to Say “YES” to a Family Law Financial Settlement. Probate Mediation. Mediation is this area is relatively new. ADR Alternative Dispute Resolution. Criminal Law vs. Civil Law Criminal LawCivil Law Deals with crime Deals with disputes between individuals/organizations. Chapter 3 Court Systems Law in Society Ms. Baumgartner. How Do People Make Money?. Discussion: What are some ways that you have earned or made money?